Celebrate the pageantry of more than 250 international performers at Dollywood’s Festival of Nations, a multi-cultural spring festival. Musicians, dancers and artisans bring a world of entertainment to the Great Smoky Mountains. From Ireland to Russia to Zambia and Ecuador, enjoy all the festivities at this five-week event where the best of East Tennessee blends with spectacular international performances for an extravaganza like no other at Dollywood in Pigeon Forge, Tennessee near Gatlinburg. Don't miss a world of entertainment from The Russian National Theatre, Peru's Yawar Chicchi folk music & dance, Switzerland's Streichmusik Alder, featuring folk music and alpine horns, master yodeler Kerry Christensen, Ukraine's Dyvo Kalynove, children's folk music and dance group, Zambian Vocal Group, Trinidad's Stix on Steel and Ecuador's Atahualpa. Yawar Chicchi delights audiences with the “dance of scissors,” the artistic symbol of Peru. A dance of religious origin featuring captivating displays of art and physical skill, the “dance of scissors” features traditional song and dance along with colorful costumes as Yawar Chicchi shares the customs and traditions of the Andean man. 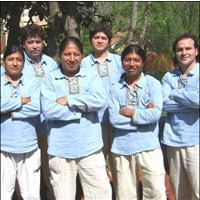 Veterans of various festivals around the world, Atahualpa's traditional rhythms celebrate the rich history and culture of South America’s Andes Mountains where salsa and meringue music creates a colorful and entertaining carnival festival for all to enjoy.